The ‘715 patent describes a game system which helps a player navigate an open grid within a game or virtual environment. 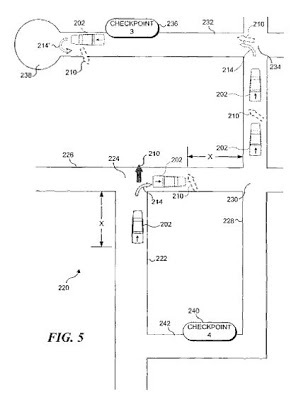 The invention calls for an indicated to be displayed which indicated a straight line direction between the current location of the player and the next unattained goal. Whenever a player nears a goal a symbol or indicator will appear on the screen to inform him of his nearness to the next goal. This invention has been used most frequently in car games like Crazy Taxi where completing goals is a vital part of the game. In that game, the character had a giant arrow above the car which directed him toward the next goal. This is an essential part of the game because it helps keep the player from getting lost and wandering around aimlessly. To assist a player in navigating an open grid within a game or virtual environment, a global indicator and a local indicator are displayed within the virtual environment. The global indicator continuously indicates a straight line direction between an object controlled by the player and a next goal unattained within the virtual environment. As the object approaches within a predefined distance from a turn that should be taken to reach the next unattained goal, a local indicator is displayed showing the direction that the object should be turned to reach the goal. The local indicator is removed from the display after a predefined time has elapsed. Preferably, the local indicator is not displayed before a turn so long as continuing to move the object along a current path without turning at the next turn will permit the object to reach the next unattained goal. 1. A method for providing assistance to a user in navigating an object to a user in navigating an object to one or more unattained goals during a game in an open grid type virtual environment, comprising the steps of: maintaining a listing of one or more unattained goals within a virtual environment for which an object is to be navigated to by a user during a game; removing any unattained goal reached by the object during game play and that is included within the listing of the one or more unattained goals once it has been determined that the object has reached the unattained goal and such that the listing of the one or more unattained goals only includes unattained goals that still remain to be reached by the object during the game; identifying a next listed unattained goal within the listing that still remains to be reached by the object during the game; repeatedly displaying a global indicator that points in a direction directly from the object toward the next listed unattained goal within the virtual environment upon determining that the next listed unattained goal is present and until the next listed unattained goal is reached by the object and removed from the listing, and by at least iteratively performing the following: identifying a current location of the next listed unattained goal within the virtual environment; identifying a current location of the object within the virtual environment; and displaying the global indicator to point in a direction directly from the object toward the next listed unattained goal within the virtual environment, and such that the global indicator is repeatedly displayed from a time in which the next listed unattained goal is determined to be present and until the next listed unattained goal is reached by the object and removed from the listing, and such that each repeated display of the global indicator points in a direction directly from the object toward the next listed unattained goal and so as to dynamically reflect change in the current location of the object as the object is navigated within the virtual environment; providing a local indicator, which is graphically distinguished from the global indicator, and that generally points to indicate a direction of a specific turn to be taken by the object in the virtual environment-for reaching the goal; and displaying the local indicator in the virtual environment at least before the specific turn can be taken by the object to reach the goal, and wherein the local indicator is displayed simultaneously with the global indicator, at least temporarily.